GarCo Grills and More offers custom-order Graysen Woods BBQ Islands! These islands have been designed from the ground up to be the best solution for creating the perfect outdoor kitchen. 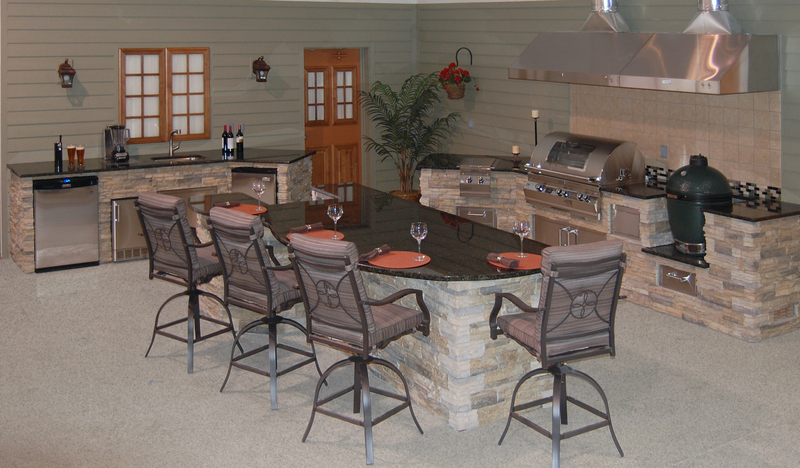 Whether your project is big or small, GarCo Grills and More will help you design an island to your specifications! A fully welded square-aluminum frame that will never warp or rust! Before island is constructed, we create a detailed drawing of your island with proper clearances for all of your appliances. This ensures that the installation of the island will be quick and easy! There are many ways to build the outdoor island, firepit or fireplace of your dreams, but none of them can match the Graysen Woods Outdoor system in terms of quality and value. Resistant to Warping and Settling? Internal Frame to Secure Components To? Can be built on a Reinforced Wood Deck? Grill Opening Adjustable for Countertop Thickness? Designed with Your Components in Mind? With Graysen Woods, you are only three steps away from having the ultimate outdoor living space! You don't go on vacation without planning how to get there or where to stay, you plan it out. The same thing goes for your outdoor room. We start out with your quick sketch and turn it into a detailed CAD plan. You can make changes to the drawing at this stage and once you sign off on it, we start building! 2-3 weeks later (typical construction and shipping time) your Graysen Outdoor components will arrive. Since you have already contacted your installation team (mason, electrician, plumber or your sub-contractor), they are ready to install as soon as it leaves the delivery truck. Simply level and connect all of the components and you are nearly done. During this step you can really see your outdoor room coming together. The siding is applied, countertops are cut and appliances are being installed. We suggest getting the guest list put together for your grand unveiling party at this point. The title really sums this step up. Gather up your friends and family and enjoy your new backyard oasis!